Today we launch an independent website for Places Journal — a new site that is not only a thorough, front-to-back redesign of our digital platform but also the start of a new era for the journal. For the past five years we were privileged to publish in partnership with the Design Observer Group. Now, as we expand our operations, we are launching our own site at placesjournal.org — and reaffirming our commitment to rigorous and lively public scholarship on architecture, landscape, and urbanism. Our new site is at once a stronger platform for our substantial articles and galleries, a dynamic portal to our deep archive, an accessible resource on complex issues, and a springboard for debate on critical topics. Beginning with the homepage, you’ll see a clean layout and streamlined navigation. As you explore the site, you’ll find article pages that enhance the online reading experience. You’ll find larger images and type, integrated slideshows, and handy social sharing. And you’ll find a fully responsive design that facilitates reading and viewing on screens large and small. But no matter the size of the screen or the type of device, what drives our editorial enterprise is the publication of excellent work that combines the narrative power of serious journalism with the precision and depth of scholarship — work that advances the cause of equitable cities and sustainable landscapes. This fall we’ll be rolling out a new series, funded by the Graham Foundation, a “history of the present” focusing on cities undergoing extreme transition. Today we publish the first installment: Daniel Brook’s report on urban development in Yangon, Myanmar, where planners, developers, activists, and government cronies vie for the right to define the city’s future after decades of military dictatorship. We’ll follow in a few weeks with a wide-ranging exploration of Havana, Cuba, as it grapples with the challenges of the looming post-Castro era. Also this fall we’ll be publishing articles on housing and the affordability crisis and on the fraught history of water in the west; there’ll be a manifesto on the growing strength of landscape architecture, a sharp analysis of humor as a form of architectural critique, and a richly provocative study of a forgotten but important chapter in mid 20th-century residential development. To name just a few of the articles on our calendar this fall. You’ll also notice several new features on the site. Places will now showcase a group of featured columnists: Keith Eggener, Gabrielle Esperdy, Belmont Freeman, David Heymann, Sandy Isenstadt, Shannon Mattern, Barbara Penner, Simon Sadler, Naomi Stead, Despina Stratigakos, and Alan Thomas have all made valuable contributions to the journal, and will continue to do so, as will our Photo Editor, Aaron Rothman. The website incorporates a new and improved version of Places Wire, our frequently updated and carefully selected feed of news and commentary from around the web. 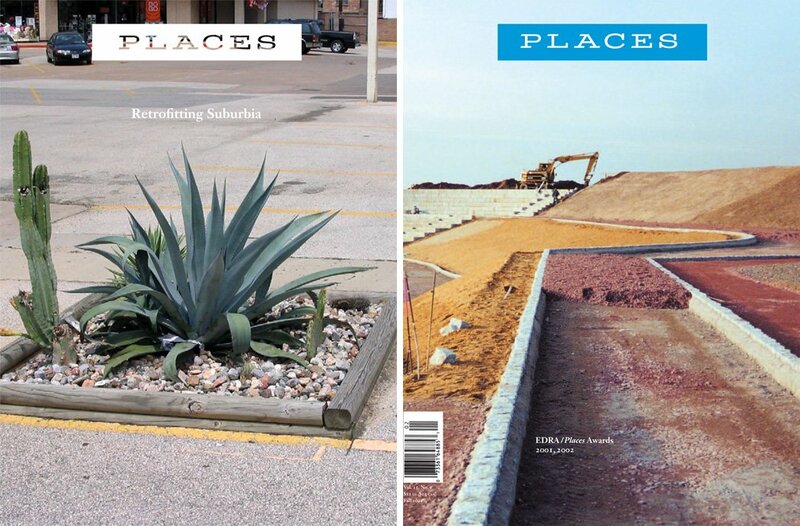 Places Books is an exciting new collaboration with a major university press — a series that will consist of selected Places articles expanded into short, topical books on contemporary buildings, landscapes, and cities. Stay tuned for a formal announcement, including the first titles in the series, later this fall. Reading Lists are also coming soon. To strengthen our capacity as a resource on diverse issues and themes, we are developing a tool that will enable readers to create — and share — topical reading lists from Places and other web-based sources. Designed by Extra Small Design, our new website will be a strong and evolving platform for all these features. Indeed, in the five years since Places went digital, after twenty-five years in print, publishing and media have experienced more or less continuous change, from the introduction of tablets and mobile apps to the phenomenal rise of social media. No doubt there will be yet more change, and here at Places we’ll remain agile and ready — and always with the larger goal of serving as a vital and trusted resource on the future of buildings, landscapes, and cities in a volatile time. For more than a decade Places Journal has benefited from the ongoing support of a network of academic partners as well as institutional and individual donors. Their collective vision and engagement makes possible our ambitious editorial project, and ensures that all our content will remain publicly accessible, and free of charge. We hope you’ll enjoy our new website, and visit us often.